There was a palpable distance onstage as discussion turned to The DAO. 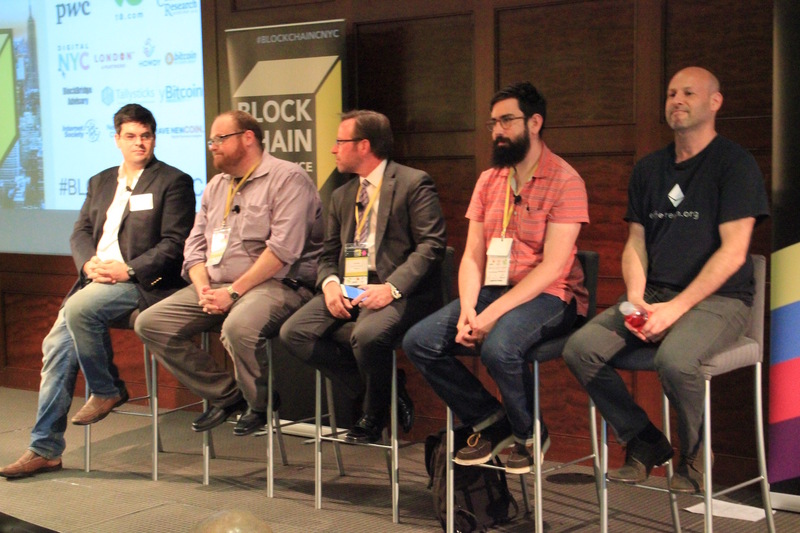 At this week’s Blockchain NY conference, the founder of a startup that forked the ethereum blockchain to build its infrastructure and the co-creator of the decentralized application network itself sat as far from each other as they could while debating the now-infamous project. Launched in May and collapsing in June, The DAO was the first large-scale ethereum-based decentralized autonomous organization, a kind of digital economic entity intended to operate without central control. But with more than $60m in investor digital currency eventually lost in the effort, the idea that the concept of a leaderless company governed by code lives on at all was a point of heated debate, and panelists expressed a wide range of conflicting sentiments on the issue. Joe Lubin, co-creator of the ethereum protocol, argued that the The DAO collapse didn’t prove the idea faulty so much as create a sense of urgency around smart contract security. He went so far as to call The DAO “a great event for our ecosystem”. Lubin’s company Consensys continues to develop different versions of two crucial components of The DAO — its leaderless governance mechanism and its crowdfunding tool. 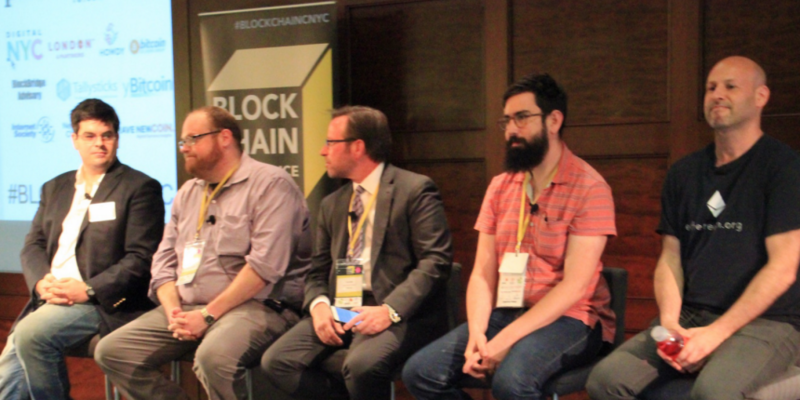 Additional panelists included Preston Byrne, whose blockchain startup Eris Industries is building on a fork of ethereum blockchain; Matt Liston, founder of predictions market Gnosis; and digital asset portfolio manager Jake Dienelt. The panel was moderated by Chris Betz, of the Enterprise Data Management Council. Launched earlier this year, The DAO was built using open-source code written by ethereum startup Slock.it and designed as a sort of venture capital firm where members bought voting rights in the form of blockchain-based tokens. Flaws in The DAO’s code eventually led to a wide range of potential security exploits, issues that continue to frame much of the ongoing debate around what exactly happened leading up to the collapse, and what might be salvaged from the project, if anything. Another panelist who like Lubin is working on a form of blockchain governance, agreed that the DAO concept isn’t dead. On the panel, Liston described the DAO collapse as a “wake-up call” to the importance of “figuring out the smart contract security code”. Pushing aside concerns about the legal position of DAOs, Liston said the future framework of DAO regulation is “what we’re inventing now”. Matt Liston’s prediction market Gnosis is designed to be used to help groups of people make collective decisions by letting them vote not on what they want to happen, but what they think will happen. But more than once through the debate, Dienelt rolled his eyes in apparent disbelief. An early architect at blockchain capital markets startup itBit, Dienelt took issue with the notion that some have proposed that the draining of ether wasn’t an attack at all. Leading up to hack, many of those involved adopted the mantra “the code is law.” Following that reasoning, Dienelt argued that the perpetrator “didn’t do anything wrong”. “They followed the code and they took the money,” he said. But later, when pushed on whether the event could be described as an attack at all, he clarified. “It was an attack. But he was the only person in the world who read the terms of service,” he said. Perhaps the harshest skeptic though to the future prospects of DAOs was Byrne. Byrne said that in 2014 his company had constructed its own DAO but unlike The DAO, his project included a “manual override” feature — also known as a backdoor, a way to stop the DAO from executing its purpose if something went wrong. Byrne objected to the idea proposed by Liston that the legal framework under which DAOs fall is being created in parallel to the distributed organizations themselves. In addition to being Eris Industries COO, Byrne is its general counsel, and he previously served as a securities and derivatives lawyer at Norton Rose Fulbright, an international law firm. To Byrne, DAO-like software might one day be used to run a corporation, “but it isn’t a corporation,” he said. So in addition to creating a backdoor during his own DAO test, Byrne says he incorporated the entity as a US corporation. Byrne further dismissed the idea the collapse of the DAO might have been beneficial by raising awareness of potential threats. In the end, automating governance doesn’t make it legal to issue digital tokens as a form of voting rights in the first place, he said.